While wireless cameras have been used in high end broadcast for years, prices have dropped and there are now a variety of products on the market to suit lower cost broadcasts, and the technology is creeping into events with live outdoor screens and lower budgets, where it adds a creative angle to the show. It is the wireless cameras that enable the big sweeping shots that follow a moving subject, and the interesting close-ups from within a crowd - those details of faces that tell the story when a longer shot would show very little. The cameras can be shoulder-carried, or carried on a stabilised rig or a rail. More recently, at Boxx TV we have been working with aerial filming, with a lightweight transmitter designed for the current fashion for filming with UAVs. Whether its a performer or a sportsman, or roaming reporters sent out into a crowd, its the wireless cameras that add movement and depth to the broadcast image. Often wireless cameras go hand in hand with a stabilised camera rig, but not always, and they are appearing at sports events, outdoor concerts and shows. Wireless transmitters are ideal for live broadcast of events such as the Brit Awards, where there is a lot of movement around a crowded auditorium. Glastonbury stands out as the high spot of the 2013 summer season, while the Bournemouth Air Show is entirely different, taking place over a much greater area. For any application, the huge advantage of the RF transmitter is the freedom for the camera operator to move around within a crowd and get close up pictures, as there are no cables to get in the way, and no health and safety issues. For a live broadcast, it is critical that there should be no visible latency in the signal between the camera and the receiver, so that the feed from the mobile cameras can be cut with the pictures from other live cameras and match perfectly, making the synchronisation between the lips and the sound exactly right. This is the highest priority for any show with live presenters and performers and live multi-camera broadcast. Any restrictions on the use of wireless cameras will relate to frequencies, RF coverage and cost. If you are using a licenced frequency band, it needs to be pre-booked beforehand, and as frequencies become crowded around live events, this can be a serious consideration. An unlicensed frequency is easier and cheaper, and with the right tools and careful monitoring it is easy to select the free frequencies. The ranges covered will depend upon the strength of the signal and the environment. 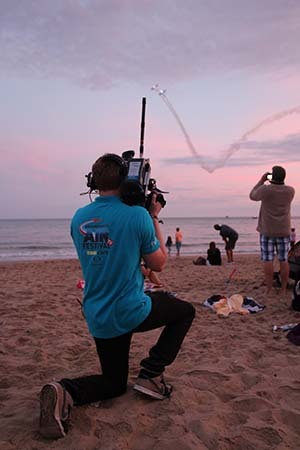 At the Bournemouth Air Show, we used a wireless Zenith system to transmit pictures from the OB van to nine outdoor screens via a digital microwave link, and another Zenith system on the back of a camera for a roving reporter conducting the interviews and vox pops. They were able to go three and a half kilometres along the beach and out to the Navy ships. To conclude, the live events market, outdoor events, conferences and houses of worship, is starting to do what live news and broadcasters have been doing for years using wireless links for the creative shots. There is no one size fits all technology. Its important to pick the right type of microwave link for the job. In some cases, zero delay is the most critical factor, say when filming singers on stage. The trade-off is that a zero delay system doesnt go as far as a compression system, which will do a longer range, like the cameras at Bournemouth going 3km along the beach. However the compression system is not as good on a multi-camera production where lip synch matters and there may be a lot of flashing lights and falling confetti. You need to know your priorities and pick the right tool for the job.